Every week a few of us from team iMore will bring you our current favorite, most fun and useful App Store apps, WebApps, jailbreak apps, even the occasional accessory, web site, or desktop app if the mood strikes us. As long as they’re iPhone, iPad, or iPod touch related, they’re fair game. The other day I watched someone struggle with Photoshop on a pc. Not long after, over on Twitter, @redwhiteandjew recommended FilterStorm. Since I was already in the image editing mindset, I decided to check it out. The Filterstorm website (http://filterstorm.com/fs4/videos) has tons of video tutorials, including a feature walkthrough. I was quite impressed with the variety of tools and ease of use, but kept thinking it was overkill for me. Nonetheless, it didn't stray far from my thoughts. And then I watched that someone still struggling with the same image in Photoshop and thought...I'll bet Filterstorm would be perfect for that. So I parted with my $3.99 and installed Filterstorm on my iPad. I must say that Filterstorm is not for the faint of heart, or the novice image editor. Its tools are powerful, and I spent time watching and rewatching all their video tutorials before attempting my first edit. But what a great job it does! If layers and curves are what you need (and who doesn't need them if you're editing photos?! ), then you will never again do any editing on your desktop. This screenshot gives you only a tiny taste of the power you get with Filterstorm. There are more options inside each filter tab. The video tutorials make it a treat to use, and you feel that help is only a click away. In my search to reduce the number of redundant apps I use on my device, I'm always trying new media server apps. I wrote about Emit in a previous pick of the week. Air Media Center is another in a long line of apps that has a mobile interface that hooks into a server component that you run on another machine. This week I tried it because of one specific thing that it offered that Emit didn't - photo support. Until Apple provides me a great way to host all the photos I want to see externally and view them seamlessly on my devices without physically syncing them all, I'm on the hunt for the best way to do this with third party apps. Previously, I kept my entire photo library in Dropbox, and used the mobile apps to view pics, but my photo library grew by a few large leaps with the addition of a DSLR to the mix, so that was out. Then I started optimizing pics and resizing them and keeping them in Dropbox, but it's a lot of effort to stay on top of my folders, and ultimately, I'm not altogether thrilled with the way Dropbox handles image viewing on iOS. It's ok, but not ideal. Air Media Center does the table stakes stuff pretty well - streams all kinds of video files with live conversion, and it does the same for music (I still use iSub and Subsonic for music though, because nothing can beat Subsonic for me right now. The differentiating factor for me as I said was photos. What sets it apart is the way in which you can browse the photos. In Dropbox, you see a list by default - just text - until you tap on one, at which point you can tap another button to view a series of thumbnails similar to the Photos app. In AMC, you get a similar list to start, but the list has reordering options; you can sort by name or date, and jump to the beginning or end of the list as such, and (wait for it) - thumbnails in the list view. As soon as I saw this, I was thrilled. Once you tap into a photo, as with Dropbox, you can load a thumbnail view of all the photos in the folder as well. But just being able to flip through the list visually first is huge for me. There aren't any options to share or to save to camera roll for the picture as with Dropbox however, so if that's something that's important to you, you'll miss it here. The interface is really nothing to go bananas over either, but as I've said before, in cases like this, it's a tradeoff I'm sometimes willing to make if it makes access to certain things easier. It's easy to configure, works great over wi-fi, and can be shared to be accessed remotely over 3G as well. The companion app is free in the Mac App Store, so if you're still looking for a media client with a little more, you're in for two bucks. As I have a jailbroken iPad I decided to try installing XBMC for iPad. For those that don't know already, XBMC was originally created as a media center application for the first-generation Xbox game console but has since been ported to lots of different platforms, one of which is the iPhone and iPad. Running XBMC on my iPad gives me access to all of my media on my networked storage. Better still I don't need to convert it to the crazy file types that a stock iPad restricts me too. This system enables me to play AVI and even MKV right over the air onto my iPad 2 and it looks perfect. Now here is the real crazy part. If you have a camera connection kit for your iPad, you can copy your video files onto an SD card and XBMC can read them right off the card. That has given me an additional 32GB of storage space! XBMC is free and you can learn how to install it from the XBMC Wiki. While I don't get much time to sit down and draw much any more, when I do have a few moments I always like to check out some of the drawing apps for the iPad. One that I've been digging for a bit now is Procreate, mainly because of the simplicity offered but should you decide to get a little more advanced with your artwork, it supports that as well. With auto-saving features, the ability to export PSD files that support layers and brush customizations, it's a great tool for artists or casual drawers alike and it only costs $0.99. Anticrop is a pretty easy to use app that does exactly what the title implies - instead of cropping an image to be smaller, it allows you to extend an image. Load up the picture you'd like to edit and drag the border in the direction you'd like to extend it. Obviously this won't work for images that have hands or people in the part you're trying to extend but it'll work for most patterns and scenery shots extremely well. It's a much quicker way to perform a quick edit than having to transfer a photo to my computer for editing. With so many jailbreak extensions hitting Cydia nowadays, it's hard to sift through everything and avoid some of the bad eggs. Many jailbreak modifications could even be considered useless for some, but once in a while there's a real gem that comes along and just can't be ignored. WeeToolbox is definitely one of the better tweaks that beefs up Notification Center in iOS 5 so much, I'm actually surprised the developers didn't end up charging for it. With WeeToolbox, you can quickly send a tweet, make a call, enable the LED flashlight, send copied text to Pastie and access your camera with just one tap, all right from within Notification Center. Calling up the camera and sending quick tweets are two of my favorite features of WeeToolbox. If I'm ever in a pinch or on the go and don't have time to load up Tweetbot, I just pull down Notification Center and with just one tap, I'm immediately tweeting away. It's extremely useful for taking photos in an instant by tapping the camera button from anywhere on the iPhone, too! It could just be me, but I swear the camera loads slightly faster from WeeToolbox versus launching the Camera app from the iPhone Home screen. This would be possible with MobileSubstrate hooks, but I'm really not sure if that's the case as the developer didn't specifically mention anything in that respect. However, it's definitely faster than the stock app, that's for sure -- and especially evident with the slower iPhone 4 compared with the iPhone 4S. I've also found the flashlight to be very useful whenever I need to light up a darkened room. Sometimes I come home late at night and all the lights are off, so instead of blindly wondering around the living room tripping over everything before I'm able to switch the lights on, I can now instantly turn on the flashlight from the Lock screen (thanks to IntelliscreenX putting Notification Center on the Lock screen, of course!) and save myself a bundle of frustration. WeeToolbox is great if you have a jailbroken iPhone, and I highly recommend giving it a try -- you'll wonder how you ever got by without it! Those were our picks, iMore Nation, so now it's your turn! Tell us your pick of the week below. Give us the name of your favorite app, site, or accessory, and tell us why it made your life more productive, more informed, more entertaining, or just plain more fun. 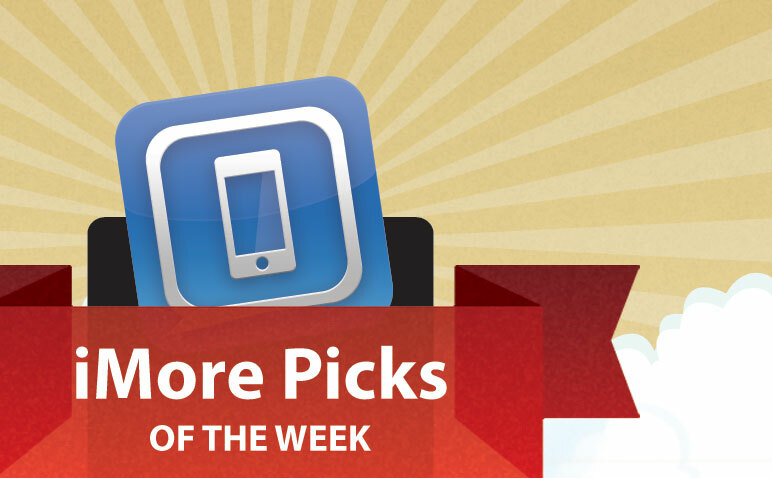 Let us know your pick of the week!